Same with some other 3D models referenced to footprints: The files do not exist in the corresponding packages. What happened to these files - and where can one get the missing files? 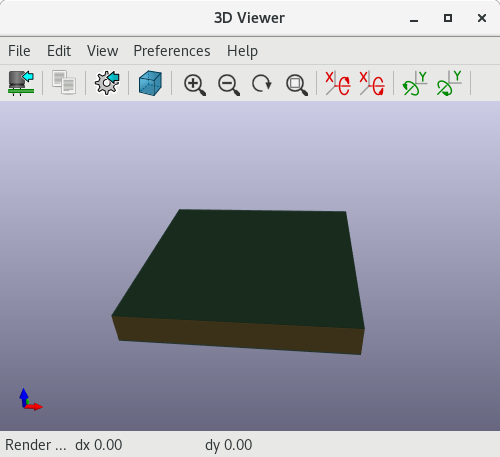 There is no 3D model because the librarians have not found a model for this component or the one they have found has not enough quality. The path is there ready for the future, when someone make the model. I have same problem after upgrade from kicad v4 to kicat v4 on ubuntu 18.04. There was problem with local kicad configuration stored in /home//.config/kicad/ in my case. So, my solution was to remove/backup old configuration and new one was created at next kicad application start. Next problem is with existing projects, because symbols are assigned to footprints with plural names (like “Resistors_SMD:R0805”), so I reasigned all symbols to non plural footprint in dialog “Assigning BCP footprints to schematic symbols” (like “Resistor_SMD:R0805_2012Metric”). From that moment were components visible in 3D view. After that all is fine. Hope this may be useful to someone. Having a similar problem. New to Kicad so no idea where to start trying to resolve this. Under /usr/share/kicad/modules I can for example see Battery.3dshapes/Battery_CR1225 step and wrl files. 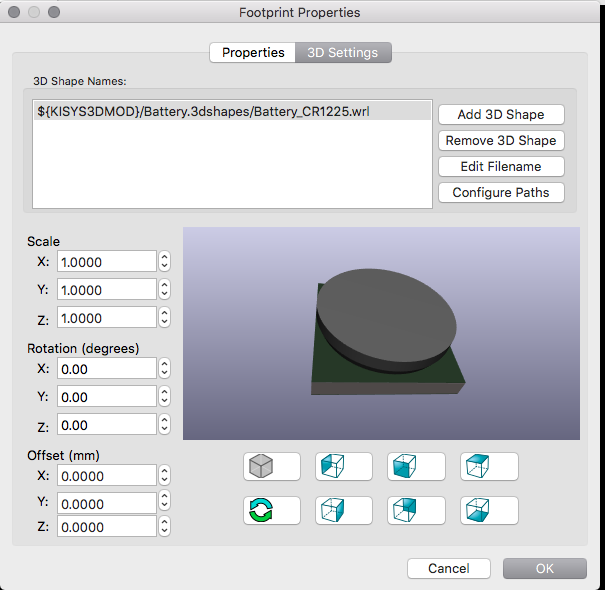 In footprint editor I place Battery_CR1225 and launch 3d viewer however I don’t see anything for this. I’ve checked the display options and also tried deleting the .cache/kicad and .config/kicad folders. What am I missing? Can’t see any 3d images for any of the components. Moved the 3d packages and all working as expected. When you click on 'Footprint properties" what do you see? EDIT _ See you have already solved this. TlDr: Don’t touch the system folders. You might loose your stuff next time you update kicad. , and everything works fine. please report what you needed to do and your operating system over on the bugtracker. I suspect that some assumptions made by the packaging guys do not hold for your system.